Minister of Defence Tina Khidasheli, who has just been appointed to the post, has named her deputies. According to her all her three deputies, one female among them, enjoy high professionalism and years of experience. Davit Ebralidze was assigned to the post of the First Deputy Minister. He will be in charge of state procurements and financial issues in the MoD. Formerly, Davit Ebralidze served as Deputy Finance Minister as well as on the position of energy ombudsmen. The ministry claims that he has years experience of working in the Chamber of Control of Georgia. Deputy Minister Beso Loladze will serve as the MoD Parliamentary Secretary. Previously, he was the member of the Constitutional Court, as well as Deputy Minister of Justice. For some time he was busy with academic activity in Germany. Another Deputy Minister of Defence, Ani Dolidze, will manage the social issues. In 2004-2006 she chaired the Georgian Young Lawyers` Association. Ana Dolidze is a PH.D in scientific law, as well as Professor of the Faculty of Law in the University of Western Ontario. She is the author of a number of scientific works. Tinatin Khidasheli introduced her advisors and assistants to the personnel of the MoD civil office and the General Staff. Imeda Darsalia will be responsible for public affairs, Nino Shengelia will liaise with international organizations and Maia Kavtaradze will be in charge of social issues. Minister Tinatin Khidasheli will nominate another two candidates on the vacant positions of Deputy Ministers later. Parliamentary opposition United National Movement member Davit Darchiashvili states that Khidasheli selected her deputies based on their political beliefs rather than their experience in the state defence-related issues. “ I have not heard Ana Dolidze to have some connection with the defence field,” Darchiashvili says. 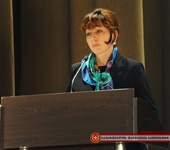 In response Dolidze informs that while being the chairperson of the Georgian Young Lawyers’ Association, she cooperated closely with the Defence Ministry. Meanwhile Khidasheli was praised by the majority MPs for her choices.